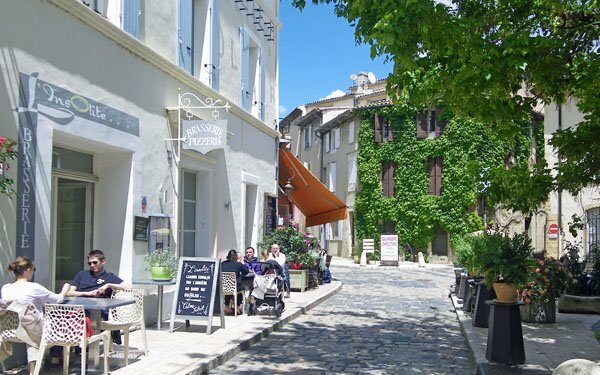 The area known as “the Luberon” is– we think– the most beautiful area in Provence, stretching about 37 miles on either side of a low, rocky mountain range, an hour or so north of the Mediterranean Sea. The Parc Naturel Régional du Luberon (the Luberon natural regional park) covers about 230 square miles extending on both sides of the mountain. The area includes a few towns, many small villages, remote farms, mountainous terrain, and beautiful countryside, encompassing a wide diversity of natural beauty, agriculture, and heritage. The mountain is actually two mountains– the Petit Luberon (2385 feet) to the west and the more massive Grand Luberon (3691 feet) to the east. 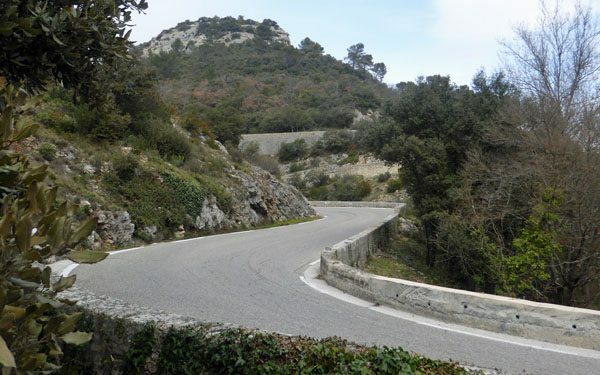 A narrow twisting pass cuts through the two mountains, with the village of Bonnieux perched on the hillside on the north side of the pass and Lourmarin in a flat area on the south side. 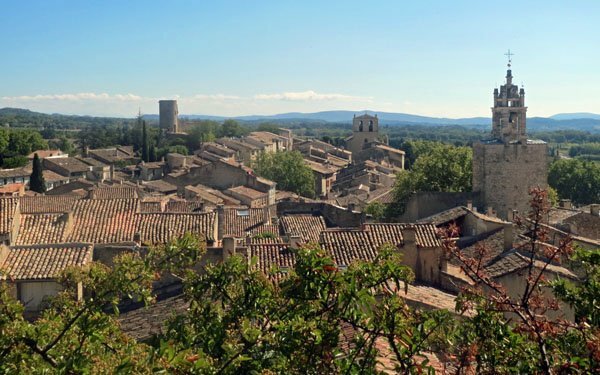 Our Luberon Experience week focuses on the north side of the Luberon, a lovely valley with incredible views across the Luberon valley to the Monts de Vaucluse and the distinctive 6,272-foot peak of Mont Ventoux in the distance. There’s so much to see and do in this area without making the drive to the other side. 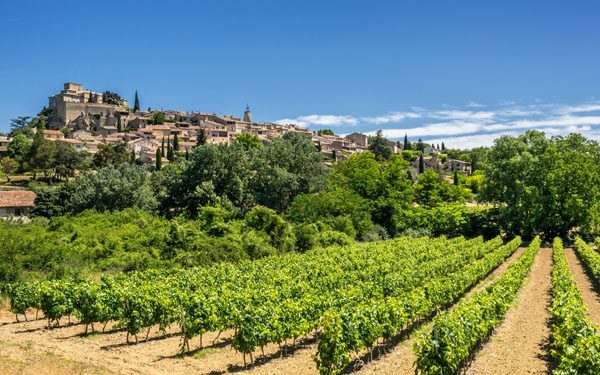 That said, the south side of the Luberon (its “Côté Sud”) offers its own distinct pleasures, and our Return to the Luberon week provides a great opportunity for our travelers to venture further south. “Return to the Luberon” is a special week for “alumni” travelers who want to experience more of beautiful Provence. We’ve hosted groups in 2013, 2014 and 2016 and will welcome our next Return group in May 2018. No two Return weeks have been exactly the same. 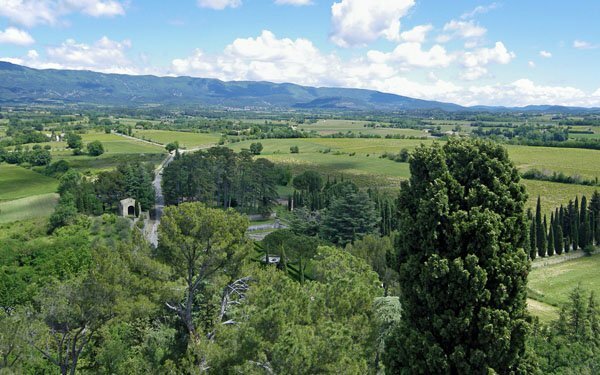 The south side of the Luberon– between the Luberon and the Durance River– has a more gentle characteristic. And there’s a more Mediterranean climate, a bit warmer and drier. Most of the villages are on flat ground, surrounded by vineyards and wineries, farms, and country estates. 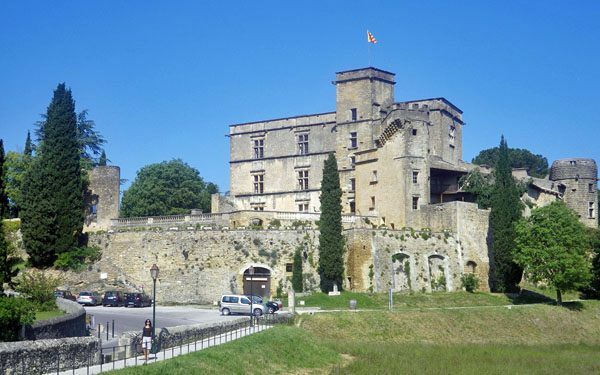 There are impressive chateaus from the Middle Ages and Renaissance eras at Lourmarin, Ansouis, Lauris and Tour d’Aigues. The Durance River, the major river and water source in Provence, sets the southern boundary, with its source in the Alps and finally flowing into the Rhône near Avignon. 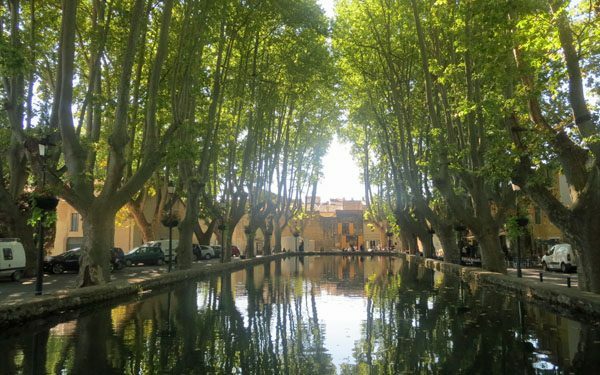 After crossing the river near Pertuis, the busy city of Aix-en-Provence lies just 30 minutes further to the south. Our Return to the Luberon groups always enjoy a very full day south of the Luberon. You could spend a week, a month or more in this area, exploring villages, markets, restaurants, shops, castles, wineries, even a recreational lake. But to get us started, we’ll focus on a few of our favorites: three villages, a castle, and a bridge. 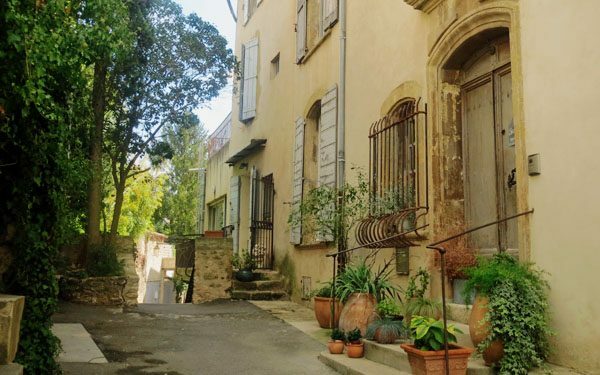 The village of Ansouis (population 1,057) is designated one of the “most beautiful villages in France.” It’s a quiet and well-preserved village, sitting on a small hillside in the midst of vineyards, topped by a beautiful fortress/chateau. There’s also a highly-regarded restaurant, La Closerie, awarded one Michelin star. 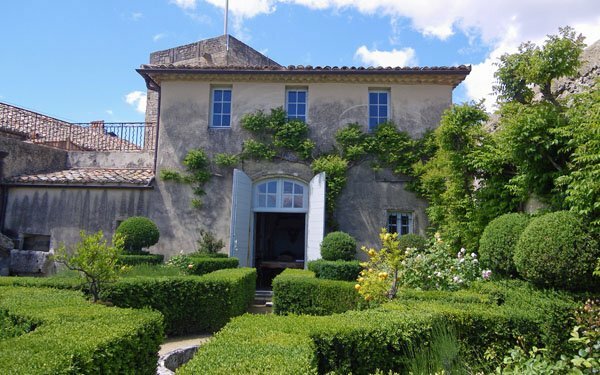 Our groups have a private visit of the Chateau d’Ansouis, hosted by its owner Madame Rousset-Rouvière, who with her husband bought the property at auction and has worked tirelessly since then on its restoration. The chateau is particularly unique because it consists of three different castles. In the center there’s a medieval fortress, parts built as early as the 10th century. Hundreds of years later when the threat of invasion had disappeared, a residential palace and gardens were built around the ancient fortress. Then on the top of the chateau, there’s a private mini-chateau with its own garden, a place for the women to retreat, kind of a boudoir. The story is fascinating! The Chateau d’Ansouis is open to the public for guided visits (in French) only on certain afternoons during the season. (Check their website for the schedule.) It’s well worth a visit, for its history, the wonderful antiques, and the beautiful views. No photos are permitted in the interior. We like to cross the street from the bassin, pass through the old village walls, and explore the medieval village. From the ruins of the old dungeon of the former castle on a small hilltop, there’s a beautiful view back across the rooftops of the village. The church– the 13th century Notre-Dame de Beaulieu — sits on a square on the other side of the village from the castle ruins. It’s beautiful inside! Be sure to pull on the door to see if it might be open. Cucuron is surrounded by vineyards and olive groves, and it’s an especially good place to buy olive oil. The heart of the village is the Place d’Ormeau, where several cafes with outdoor seating share either side of the small square. It’s a great place to have coffee or an apertif if you’re just passing through or lunch if your timing is right. 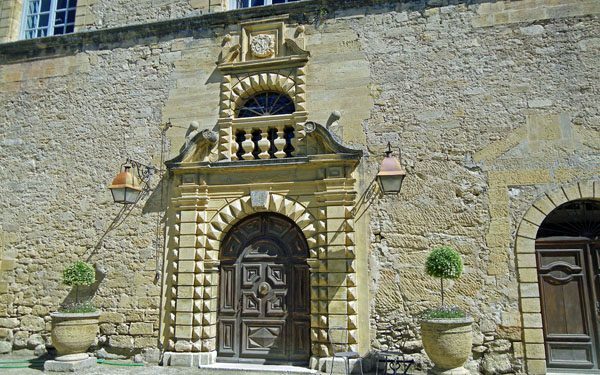 Lourmarin has several fine-dining restaurants. 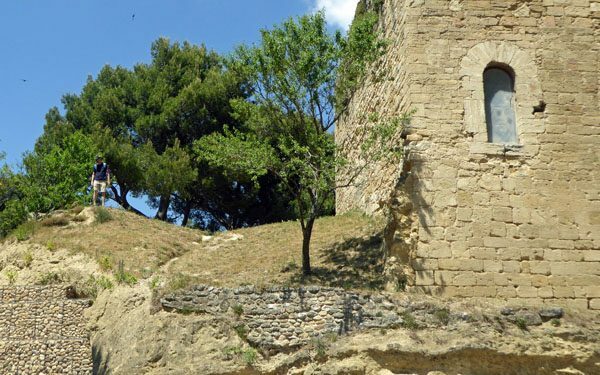 The chateau of Lourmarin stands on the edge of the village. Originally built as a fortress in the 12th century, it was transformed in the 15th century and later fell into ruins. Today it’s a museum and a center for the arts, open to the public year-round. We always enjoy exploring the quiet streets away from the main commercial streets. If there’s extra time before returning to the north side of the Luberon, we recommend a short diversion to visit the unique “shell bridge” over the Aiguebrun River. The bridge is a historic monument, built in 1722, featuring a detailed shell pattern on one side of the bridge… quite a surprise to find in such an isolated setting! 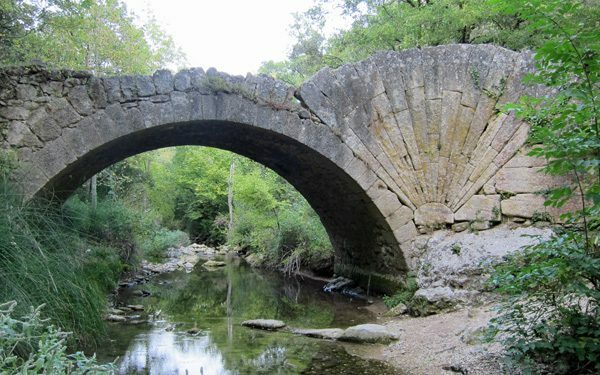 Perhaps the bridge was once on a major route, but today it’s on a trail, an easy half-mile off the main road through the Combe de Lourmarin. Coming from Lourmarin toward Bonnieux on the D943, pull off to the side of the road after passing a big farmhouse on the left, just before the the hairpin curve and the left turn to the D36 which continues to Bonnieux. There is room for a few cars to pull over on the right side of the road. The trail is marked with a signpost at the Grottes des Brigands. Once at the bridge, climb down on the left of the trail to see the unique shell pattern. I’ve finished this post in the Atlanta airport, on my way to Provence and a few relaxing weeks back in our Bonnieux apartment. 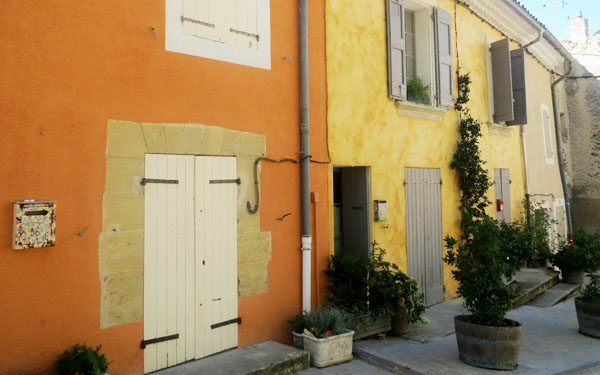 I’m definitely planning to spend at least one day south of the Luberon! 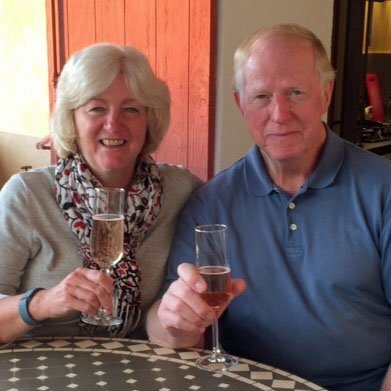 I never tire of reading your wonderful insights into this lovely area ..still have so many places to see.. especially the shell bridge… thank you for all your work Kathy, those of us who are restricted to more ‘vicarious travel ‘ than real time, are so indebted. Oh so many of our favorite places – I’m eager to return!